Just one dilemma facing modern couples today is their internal debate whether to embrace or reject traditional notions of weddings, and marriage for that matter. While there really is no right or wrong answer in this decision, many couples ultimately approach planning their weddings as a way to share their styles, personalities and beliefs with their families and friends. But, that can sometimes be easier said than done. Couples can look at their wedding as an opportunity to give everyone a deeper insight into who they are now as adults starting married life together. It is likely that there may be some relatives and possibly friends that have not been seen since childhood or school years, and perhaps don't know much about who you are now and what interests, goals and beliefs brought you together as a couple. When else are you going to have the undivided attention of so many people in one place? So put some personality into those wedding plans. Wedding traditions have been around for decades that basically give couples a road map for planning. However, if you have issues with some traditional customs or are just looking for fresh ideas, the suggestions below might help. These ideas are inspired by some of the most memorable weddings we have experienced as photographers over the past decade. Modern Idea: Having bridesmaids wear unique dresses has become more common over the last couple of years, but perhaps consider taking this a step further so more people (groomsmen specifically) can get in on the fun. We loved the period-fashion theme weddings we've seen including: a Great Gatsby 1920s style flapper wedding, a 1940s style wedding with groomsmen wearing white tuxedo jackets, and a 1950s sweet summer casual wedding where the bride and bridesmaids wore short party dresses and the groomsmen wore cool seersucker suits with Chuck Taylor All-Stars sneakers. Modern Idea: If you rather create a different vibe for your reception than just the traditional dinner, cake cutting, and dancing, you may want to try a an entirely different approach, or incorporating a different "party style" along with the basic reception traditions. Cocktail style receptions have been increasing in the last few years, with more of a mingling party atmosphere instead of a formal sit-down dinner. 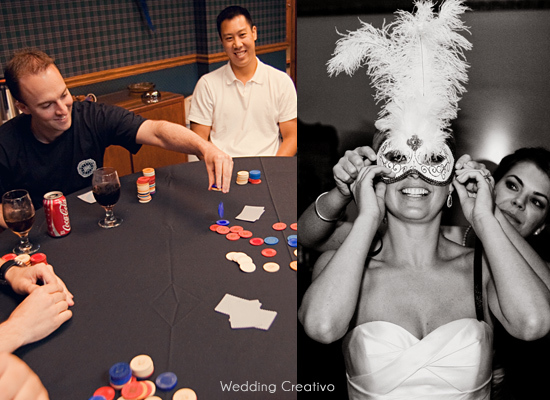 You could also incorporate festive party themes or activities such as Hawaiian Luau, live karaoke or talent show, a 1920s/30s vice room for poker or other parlor games, or any favorite recreation that you enjoy and that expresses your interests. One of our couples transformed their reception into a Venetian masquerade ball by hiding a variety of Venetian masks under guests' chairs and surprising them with an announcement by the groom when it was time to open the dance floor. Modern Idea: Many couples don't feel comfortable including these traditions any more for various reasons. However, you can modify this and still keep your guests engaged without the groom having to climb under the bride's dress. You can still give away the bouquet, table centerpieces or other fun prizes with alternative fun activities. Many couples enjoy doing the anniversary dance where the longest married couple remaining on the dance floor wins the bouquet. We've also seen live auctions with prizes going to the highest bidder (this can also be a fun alternative to the dollar dance), and especially cool if you have a relative or friend who is a professional livestock or art auctioneer that can wow your guests. Instead of all pulling the single people on the dance floor, gather all of the kids for a stuffed animal toss. 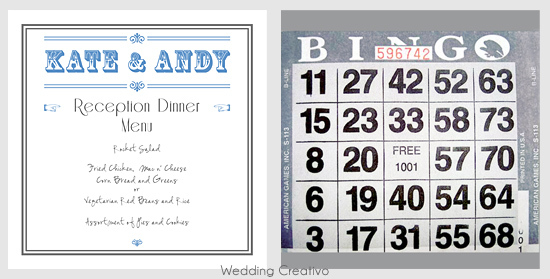 Finally, we think it would be fun to involve all of your guests in a big game of Bingo during dinner service. Order your personalized version of this card on the Wedding Creativo Etsy Store! 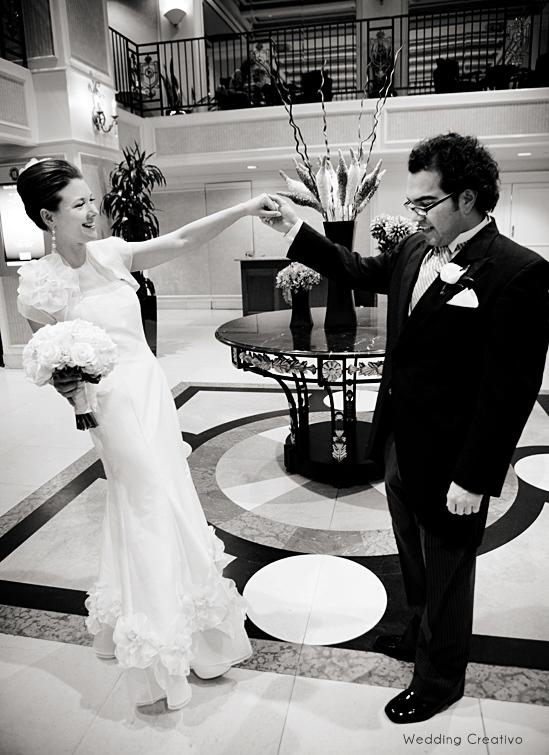 Modern Idea: Many couples these days come from diverse backgrounds and faiths, so it is fairly common to see traditions from different cultures or religions being combined at weddings. However, some couples have liked what they have seen at a friend's wedding, and even if it is not part of their family background they have made other cultural ideas part of their own ceremony or reception. 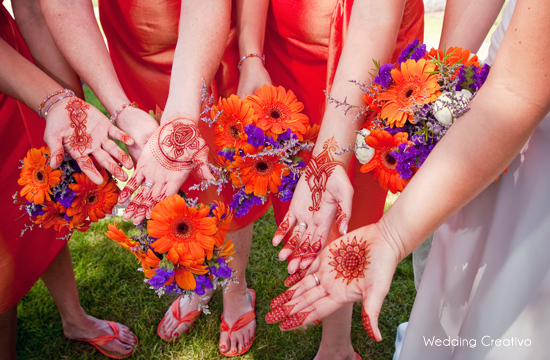 Eastern cultures including South Asian / Indian have unique three-day weddings and different rituals compared to Western weddings. Consider researching weddings from countries or cultures different from your own, and what meanings they have, and perhaps you can "borrow" an idea from another culture if it better expresses your personalities or beliefs. Modern Idea: Several of our couples have incorporated a special pre-ceremony "first-see" moment and outdoors tour for creative portraiture. By scheduling an hour or two with us before the ceremony, we have been able to capture some absolutely stunning moments with couples in settings from urban alleyways to floral parks, and everything in between. Couples that do this often feel more relaxed throughout the day and also realize they get to see each other "for the first time" twice: first a private moment together, and again at the ceremony with their guests. Whether you decide to go traditional or not, your wedding will be best remembered by your unique personal expressions. ﻿Article by Sarah Toulouse Wedding Creativo Photography.